Was there an e-reader under your tree this week? Amazon announced that over 4 million Kindles were sold in December, and analysts predicted high sales of the iPad 2 over the holidays. Whether you’re a brand-new or veteran e-reader, we have a deal to help you load up your device and get reading. We are offering 10 of our popular history e-books for just $4.99 from now until the end of January! After the presents have all been opened, the cookies are gone, and the tree needles start to fall, what are you going to do with the kids for the whole week?! 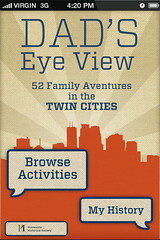 Check out our newly updated iPhone app, Dad’s Eye View: 52 Family Adventures in the Twin Cities. 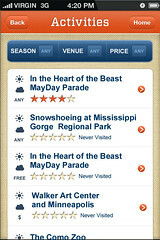 Twin Cities digital dad Michael Hartford added twenty-four new family venues to the app this month. This past May we released the print edition of the book Dad’s Eye View with an accompanying free iPhone app that allows readers and users to discover the most affordable, educational, and, yes, fun things to do and see throughout the year in the Twin Cities. Some of the updated venues for kids with cabin fever include Edinborough Park, Maple Maze, Memory Lanes, The Landing, and Elm Creek Park Reserve. * Rate and share your outing on Facebook and Twitter or on the Dad’s Eye View Facebook page and @Dads_Eye_View! Today’s blog post is by Adele Porter and Bill Marchel, author and photographer of Birds in Our Backyard: Say Hello to Minnesota’s Feathered Friends. In Minnesota, we are hoping for a great gray winter. How can winter be both great and gray? It is if there is an “irruption” of Great Gray Owls moving southward out of Canada into Minnesota. All it takes is a very wet, very cold spring and summer in the Canadian peatlands, and the population of meadow voles plummets. This happens on the average of once every three to four years, sending Great Gray Owls further south in search of food. Nearly 80 percent of the Great Gray Owl’s carnivorous diet comes from meadow voles. That’s a big lean on just one food item. “I remember a particular Great Gray Owl I photographed one cold and clear winter day a few years ago,” said wildlife photographer Bill Marchel. ”The snow was nearly waist-deep that year, and I wore snowshoes to help me get around in a tamarack bog. Over my shoulder I carried a tripod-mounted camera and a backpack full of photography gear. “It was sunny but cold that day. My cheeks were rosy and fingertips numb. It was nearly sunset when I spotted a Great Gray Owl perched on the tip-top of a small tamarack. “The bird allowed a close approach–as they often do–and after snapping a few pictures, I relaxed while I studied the owl. Totally ignoring me, the owl swiveled its huge head left and right on what I figured must be a neck containing well-oiled ball bearings. But it was the bird’s yellow eyes that demanded the most attention. I thought for a minute. Piercing? Sort of. Striking? Maybe. Captivating, that’s it! It’s those captivating yellow eyes. 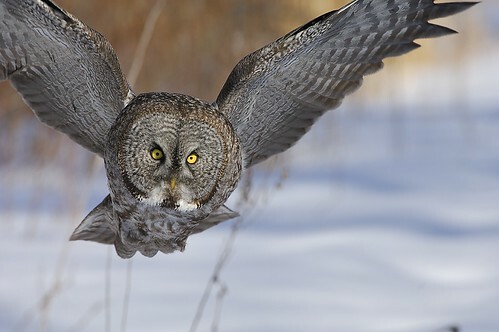 That’s what is so alluring about Great Gray Owls–those captivating yellow eyes. I snapped a few more photos. “Peering through the camera’s viewfinder, I noticed the owl suddenly become alert. Its attention was focused somewhere in the open bog beyond me. Then the bird took flight. It started out low and in my direction. My camera whirred as it advanced from frame to frame while the owl approached. The big raptor passed so close to me that I felt the wind from its giant spreading wings. But I heard not a sound. Its flight was totally silent. The name Great Gray Owl is a clue that this gray owl indeed looks large. Take away the dense feather mass, however, and this owl is taller but lighter in weight than its northern cousin the Snowy Owl. Great Gray Owls can measure about 2 to 2 1/2 feet tall with a 4- to 5-foot wingspan (about 50 to 60 inches). They wear a white bow-tie with a black knot and have yellow eyes. Their two large feathered facial disks serve to funnel sound directly to their ears, which are under the feathers on the outer edge of each disc. The owl’s ears are positioned at different levels on each side of its head, which allows it to “triangulate” the sound and pinpoint the vole under the grass or snow cover. To get a look at this large owl, take to the roadsides, fields, and open coniferous forest edges near a river, bog, or stream at dawn and dusk this winter. It dines most often in the low light of sunrise and sunset. If we are fortunate enough to see the wide wings of this predator ranging over the northern states in the next months, our hopes may have materialized into a great gray winter. Win a copy of Birds in Our Backyard! Visit photographer Bill Marchel’s website for the answers to these questions, and submit links to pictures of the birds from his website in the comments section of this blog. Deadline for submissions is Thursday, December 15, at noon. One winner will be randomly selected from correct submissions. This bird is blue and white and has a crown atop its head, and is not a belted kingfisher. What is it? The state bird of Minnesota. Look for another chance to win a copy of the book on Thursday! Today’s post is by Paul Maccabee, author of John Dillinger Slept Here, which inspired a recent episode of Off Limits on the Travel Channel. Explorer and history buff Don Wildman had braved an underground Titan II nuclear missile silo in Arizona, prison cells inside San Quentin, and a former Nazi military compound for his Off Limits TV show on the Travel Channel. But would Wildman survive a visit to the St. Paul gangster haunts frequented by such Public Enemies as John Dillinger, Alvin “Creepy’ Karpis, and Babyface Nelson? As the author of the MHS Press book John Dillinger Slept Here: A Crooks’ Tour of Crime and Corruption in St. Paul, I got to serve as Wildman’s on-camera guide to the Minnesota underworld for a segment that was shot in July and began airing on November 17. Easily our grisliest adventure was filmed in the basement of the downtown St. Paul Police Department. The TV crew secured a rare view of the bullet hole-filled hat last worn by John Dillinger’s machine-gunner Homer Van Meter–a hat autographed by the four police officers who shot Homer to death on August 23, 1934, just outside the Minnesota State Capital off University Avenue. Van Meter’s hat, which had vanished and was missing for more than three decades, was rediscovered in time for display during the show. Members of the St. Paul Police Historical Society also unearthed artifacts from the 1928 gangland assassination of St. Paul’s Irish Godfather Danny Hogan, who had guided the underworld from his Green Lantern bar. Wildman was enchanted by these artifacts from St. Paul’s dark past, perhaps most by the bullet holes, blood, and cerebral matter that were still visible inside Van Meter’s unlucky straw hat. Here’s an outtake from that creepy moment. Appropriately, the Travel Channel’s TV crew lunched at Cosetta’s on West 7th Street, where I regaled them with tales of Minnesota mobster Rocky Lupino and other homegrown Mafioso over bites of ravioli and meatballs. Then, Wildman toured the courtrooms of the Old Federal Courts Building (now Landmark Center), where members of the Dillinger and Barker-Karpis Gang were tried for kidnapping and other federal crimes. We retraced the steps of Dillinger’s comely girlfriend, Evelyn “Billie” Frechette, who attempted to escape from federal authorities on the third floor, and slipped inside the detention room where FBI director J. Edgar Hoover had chained Alvin “Creepy” Karpis before dragging him into court. But Off Limits is dedicated to bringing its camera to places where the public cannot go, so we also climbed to Landmark Center’s guano-spattered roof for a panoramic view that included the 1920s Bucket of Blood brothel area once presided over by madame Nina Clifford (now the site of the Science Museum), landmarks associated with the 1933-34 kidnappings of millionaires Ed Bremer and William Hamm, the gangland caves along the Mississippi River where bootleggers kept their illicit liquor, and hotels that were frequented by mobsters Bugsy Seigel and Al Capone. Catch it on reruns, or pick up a copy of John Dillinger Slept Here and take your own personal gangland tour. 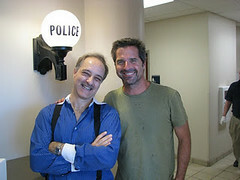 Today’s blog post is by Dave Kenney, author of several books, including Twin Cities Picture Show. Find out more about his current obsession at MN70s. Earlier this year, I got a call from Emily Goldberg, a producer at TPT (Twin Cities Public Television). She was putting together a new edition of the network’s popular “Lost Twin Cities” documentary series (based on the book by Larry Millett) and was wondering whether I’d like to be one of the show’s talking heads. She wanted me to talk about two movie theaters—the Cooper in St. Louis Park and the Terrace in Robbinsdale—that I described in Twin Cities Picture Show. She knew perfectly well that authors almost always jump at the chance to drone on about the subjects of their books. I magnanimously agreed to help her out. Emily had chosen two of my favorite theaters. The Cooper was one of the first showhouses built specifically to screen Cinerama movies. Located near what is now the intersection of I-394 and Highway 100, it looked from the outside like a huge, orange oil storage tank. Inside, it was all 1960s swank with walnut paneling, black brick, burnt orange furnishings, and blue acoustic ceiling tiles. It was demolished in 1992. The Terrace was a true gem, one of the finest examples of what became known as ultra-modern theater design. Opened in 1951, it featured a sunken “country club” lounge, a refreshment bar, a television room, and a soundproof nursery where baby boom parents could hide with their crying children. It remained one of the Twin Cities’ classiest movie theaters until the 1980s, when its big auditorium was carved up into three smaller theaters. It showed its last movie in 1999. We did the shoot for the Terrace segment outside the theater itself—which survives today in depressingly boarded-up fashion. 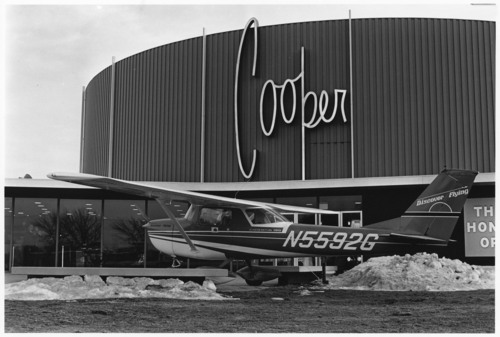 Since the Cooper no longer exists, we needed a stand-in location that somehow evoked its midcentury aura. Emily settled on the Riverview Theater in South Minneapolis, an inspired choice. Emily encouraged me to talk in personal terms about the two theaters, but there was only so much I could say. I remember going to only one movie, the original This is Cinerama, at the Cooper, and my memory of that experience has faded considerably over time. I’m sure I saw at least one film at the Terrace (I remember a theater with tons of big picture windows, and the Terrace is the only one in the Twin Cities that matches my recollection), but beyond that my mind is a blank. Most of my “memories” of the Cooper and Terrace are bits and pieces of the past that I’ve gleaned from the surviving historical record. I guess they will have to do. I haven’t seen “Lost Twin Cities III” yet. I’ll be watching with everyone else when it debuts Wednesday (December 7) at 7 p.m. One thing I do know, though: the likelihood that I’ll look stupid on the air is now considerably less than I thought it would be. Emily had to excise the Terrace segment due to time constraints. Only the Cooper segment made the final cut. I apparently will have to wait for “Lost Twin Cities IV” to find out what I said about that old boarded-up theater in Robbinsdale. –Dave Kenney is the author of several books including Twin Cities Album, Minnesota Goes to War, and Honor Bright: A Century of Scouting in Northern Star Council. He is currently working on a book on the history of 1970s Minnesota with Thomas Saylor. Follow him @MN70s, on Facebook, and on tumblr. Photograph, showing a promotional prop for the local premiere of Airport in 1970, from the Star Tribune collection of the Minnesota Historical Society.